No questions asked, having a dog keeps me motivated to move more. He is hands down the number one reason I put on my walking shoes and step outside… or that I even factor it into my daily routine. And I LOVE it. I love that I can now easily reach my daily goal of 10,000 steps. I love seeing different parts of the neighborhood and surrounding community. I love meeting new neighbors and dog owners. I love spending quality time with my pup doing what he loves to do. Am I a crazy dog person? Yes. But am I moving more? YES. Before having a dog, I was more of a treadmill runner compared to outdoor runner. (I was also not a dog person, but that’s another story). There is nothing wrong with treadmill walking or running, but now I spend most of my physical activity time outdoors. My motivation = if my dog doesn’t exercise, he will be wild. Once we got our walk/run weekly routine down, I wanted to make sure I was still getting in some strength training exercises. When we finish our walk, Boone (the dog) relaxes in the backyard while I do a few exercises using my own body weight such as push ups, squats, tricep dips, and planks. On one of our walking routes there are benches every few hundred feet and this is a great opportunity to incorporate these exercises during our walk. What are other exercises to try? This article shares 4 simple exercises to do with your dog and here is a whole page full of different body weight exercises (for all styles and levels– with or without a pup). Fellow team members Kelly, Jen, and Greg have all shared how their dog(s) help them move more. 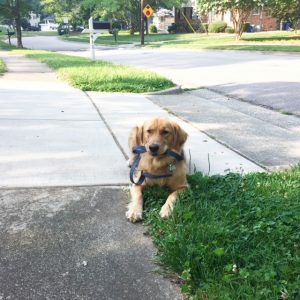 Do you have a dog that keeps you moving? Or favorite strength training exercises to share? Let’s hear them!